I have created an online photo gallery and have posted some of my pics from Africa. More will follow. Go to thedaver.smugmug.com to see the pics. Well, It has been almost three weeks since I've returned from my trip to Africa, returned from seeing some amazing sights and amazing people. I guess I feel the need to compose some sort of fitting summary for my trip, but the task seems a bit daunting. How can I put into words an experience which I can't even adequately express to myself? I suppose I'll try, but please be aware that even as I write, I write knowing that I will fail to find the proper language. Some things, I think, go beyond our ability to express truly. Some things end up being so personally and intimately meaningful that it is pointless to seek words with any hopes of being accurate. Nonetheless, here goes. I have been asked, more than once, what good it does the children to have us come visit them. To be honest, I'm not entirely sure, but here is what I've come to think so far. First of all, these children are appreciative of your prayers. It isn't like these kids don't know they are orphans and are leading a somewhat desperate life. The are certainly aware of the long odds life has thrown at them. However, they are also children of faith, and have been taught the value and efficacy of prayer. To hear others are praying for them, interceding for them before God, truly cheers them. When you admit to me that you are praying for the children, and when I relay this information to the children, there is a two-fold effect: 1) The mystical power of prayer kicks in (I won't even pretend to be qualified to expound on this, so I won't. I just believe it's true), and, 2) The children feel "connected." They are intrigued and encouraged when they hear that people across the ocean, people they don't even know, are praying for them. Even if prayer didn't work (theoretically), the very fact of someone holding the kids in their thoughts would be of value. Another benefit that I see is the effect that the children have on the visitors, and how this effect motivates people, drives people, to want to help. The BCC, relative to many things I've seen in Nairobi, is quite nice. 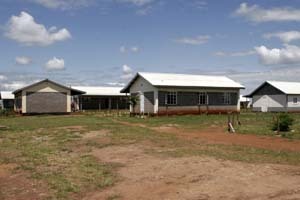 Buckner has done a great job of providing a caring staff, nice facilities, and a well-thought out approach to managing the orphanage. But none of this has happened in a vacuum or without funds. I can't speak for Buckner, since I don't work for them, but I assume that much of their resources and manpower has come as a result of individuals being moved by what they have experienced on trips such as mine. 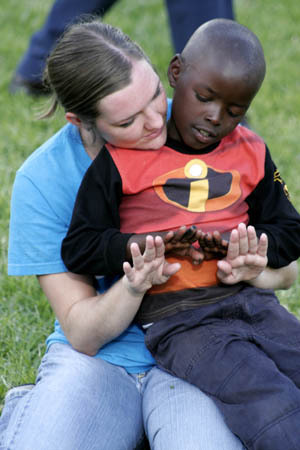 People on these trips, by all appearances, are so affected by the experience that they are often led to contribute time and money, all of which helps the orphans. In addition, I suspect that many trip participants go home bursting to tell the story of the BCC, which draws more people into involvement, which leads to more funding and resources. 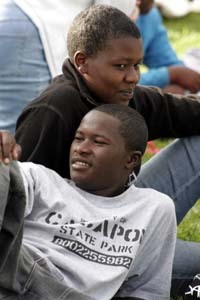 It is very evident that when people spend time with these children, their hearts are broken and they are moved to act. Finally, let me mention one other benefit, this one pointed out to me by Tony Wenani, a remarkable young man who lives at the BCC and serves as minister, manager, coordinator and father-figure. 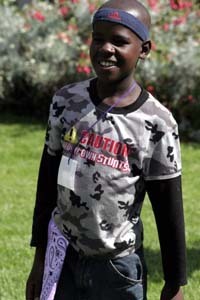 Tony asked me to keep in mind that most of these children have little or no family. Obviously, as orphans, they have no father or mother, but many also have no known relatives. What an empty and disconnected feeling this must be, particularly in a place like Kenya where family is so valued, but which is literally teeming with thousands upon thousands of orphans! How lost these kids must feel at times, how lonely. Our presence (according to Tony), then, provides the children a sort of "family". Not one to replace a real family, of course, but a group of people who, somehow, are able to stand in as sort of a "proxy" family. These kids, like almost all others I've ever known, love to be hugged, love to be told they're special, love to be paid attention, love to be told they are loved. And as a trip participant, this is what you do. Not because you feel like it's your duty, or because you think the kids will appreciate it, but because it's how they make you feel. Speaking only for myself, but confident I'm not alone in this sentiment, I could no more not hug and love these children than I could hold back the tide. The result is that these kids, while without family, do gain a strongly passionate group of advocates, people who consider them to be, in some sense, a part of their family. somewhat like sons and daughters. Although this is no replacement for a loving family, even a foster family, it is often-times more than what they've ever had before, and I can't imagine that it is ever a bad thing to be loved by others. In my mind, then, these things are some of the contributions to the children of the BCC produced by such trips. I always like to point out that I am often-times wrong about such things, and my take on the matter should be taken with a sideways glance. Perhaps as I learn more and more about Buckner and the BCC, I'll gain new perspectives and knowledge, both of which I will gladly share. It was another amazing day with the children of the BCC. These kids are so…so….well, words fail me. One of the first things you notice about these kids is how absolutely beautiful they are. I mean it. They are beautiful. Their features are so elegant and expressive. They have amazing smiles. They take pride in their appearance and how they present themselves. But more than that, they all have a certain quiet air about them, almost a dignity, even at 7 years old. I may simply be putting an American spin on a Kenyan disposition, but to my eyes these kids seem noble (it’s the best word I can think of). I’m not sure if this aura of quiet dignity is found throughout Africa, but it is one of the things that makes us Americans fall so helplessly in love with these children. And smart. Despite their difficult life, and despite a school system which groans under it’s own weight, these kids are, in many cases, razor sharp. Spend 2 minutes talking and you quickly realize that these children could hold their own in any school system in the world, if only they’d be given a chance. Most won’t make it through school empowered enough to attain anything resembling success as we Americans know it, but it certainly isn’t due to any lack of natural ability. On the contrary, in many ways these kids can process thought and see issues in a way that strikes awe in me. 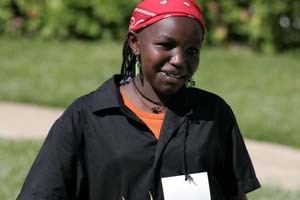 I watched a simple game of checkers (“draughts” to the Kenyans) between two boys, each about 15 years old. One boy, Paul, was recognized by the other boys as the best at draughts. Charles, his opponent, was thought to be a worthy challenger. Let me just say that in all of my years of playing and watching checkers, I have never seen, nor even imagined, a game of checkers being played with the skill that these two boys displayed. They were laughing and teasing one another, but I just stood there with my mouth hanging open as they plotted chess-like strategy. They tried to control the sides, dominate the middle, feint advances. They had decoy pieces. They backed all of their moves up with strategy launched 4 moves previous. In the end, the surprise winner was Charles. The two boys laughed and shook hands, totally void of any American-type bravado. They both enjoyed their game of draughts, knew it was well-played, and cared not one whit about the outcome. Yesterday we took the kids to a “theme” park. There really isn’t anything in the U.S. to compare it too, so I’ll just describe it briefly. Located outside of Nairobi a bit, the “Paradise Lost” theme park occupied a fairly large chunk of land. There was a small lake, a really cool waterfall, a “pre-historic” cave, and a park area where many people had set up picnics. The kids got to go on camel rides, feed an ostrich, explore the cave, scramble on rocks by the waterfall, and just enjoy being out with one another in a new and exciting place. I did see one thing which disturbed me, however, and if I am interpreting it correctly it shows just how difficult a life these kids have before them. Obviously, around us Americans these kids are king and queen. They are the center of our small universe, and we all think them wonderful. But at the theme park, while waiting for a boat ride in the lake, I saw a different, and more accurate I suppose, reality. What I saw is that these kids are ignored by their society. Time after time a boat would be retrieved by the staff working the boat ride, brought to shore, and loaded with new passengers. And time after time I saw these children ignored or, on occasion, flat-out denied. The staff would bring the boat to shore as far from the kids as possible. If the kids tried to go to the boat, other people would cut them off. Lifejackets, required for riding, would be passed over the heads of the children to other waiting behind them. For almost an hour I observed is. Perhaps my interpretation is wrong, or perhaps I am missing something cultural, but my impression, my strong impression, is that these kids stood out as orphans in a society which 1) strongly values family, and 2) is saturated with kids just like them. Because of their societal standing, these kids were treated as if they didn’t exist, and was very disturbing to me. Again, I want to say that I may have been misinterpreting the situation, but nonetheless, it stings. We all feel that what we are doing here is valuable. 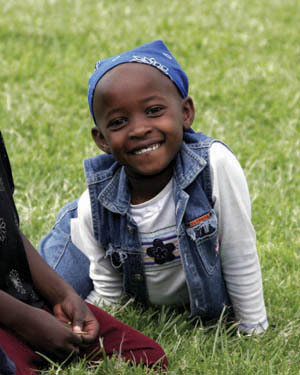 We all think that our presence here can make a difference for these children. We may be fooling ourselves about any sort of long-term impact, but we know that for a short time we can honor and love and dignify these kids. We also know that the love of Christ exemplified can result in powerful happenings. It is our hope that the love we share with these kids takes root, and that God uses this experience to give these kids hope and peace. Buckner does a fantastic job of meeting the needs of these kids, but at some point they will have to leave the BCC and make their own life as best they can. Pray for them in this regard. Pray that the few days we get to spend with them will somehow, through the blessing of God, make a difference in their lives. We only have two days left with these kids. I wish I could spend a lifetime with them, protecting and providing for them, but I can’t. All of us on the trip, I think, feel a certain urgency in what we are doing and want to jam as much love as we can into these last 2 days. Pray for us in this endeavor. I have provided a few more photos…enjoy. Well, how do you describe the indescribable? How do I paint a picture of something that can really only be experienced? This is the problem I face as I try to provide an update of our experiences with the children of the Baptist Children's Center (BCC) on a beautiful Kenyan Monday. Before I continue, let me provide a bit of background on the trip and the people involved. I am traveling with an organization called Buckner Orphan Care, which in turn is a division of a bigger company (Buckner) which exists to serve primarily orphans and widows. 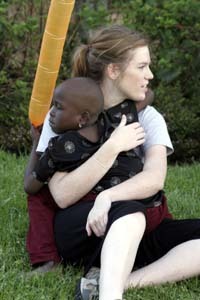 Buckner works with both domestic and international orphans. From what I know (not too much), Buckner seems to mostly serve as a consultant to orphanages and related programs, and facilitates support and mission trips to the various countries where the orphanages are located. 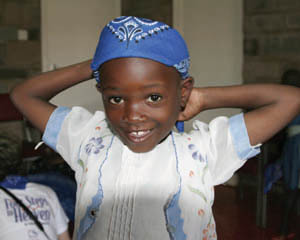 The orphanage that we are dealing with in Nairobi (the BCC) is different, however. In this case, Buckner completely manages the BCC: Buckner provides all of the funding for the staff, the child care, the facilities, etc. In fact, the employees at the orphanage (I believe) ARE Buckner employees. Buckner takes donations and contributions from churches and individuals to manage the BCC and to assist the children through a variety of programs. 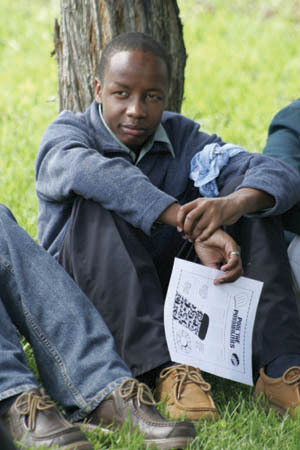 They also meet their basic needs of clothing, food, school and supervision. Below is a view of a BCC dormitory area. The common washhouse is on the left. As you can see, the BCC, while very nice for the kids, is a bit barren. So, for the kids their trip to Brackenhurst is an amazing experience, one they look forward to all year. 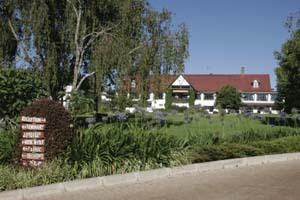 Below is a photo showing a view of the Brackenhurst main lodge. Afterwards, we moved into the VBS and recreation programs. 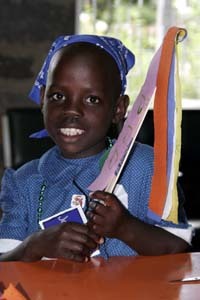 Bible stories, memory verse, crafts and recreation were all parts of the program. The kids constantly amaze us with their creativity, their sweetness and their knowledge of the Bible. They are truley amazing! Later in the afternoon (after tea time, of course!) we spent an hour or so just hanging out and getting to know one another. This was truly a special time, and the kids loved it (not to mention us)! After dinner, we then had a great time with the kids as they got to decorate their Christmas stockings. They are so creative! They love the glitter, paint pens, markers, stick-on letters...everything that was provided. The kids really enjoyed doing this and look forward to when these stockings will be filled! Finally, at the end of this busy day, the kids headed to bed. Those of us on the trip then took a few minutes to reflect on the day and the kids. I can only speak for myself, but my feelings for these kids and for this experience cannot be put into words. They are so precious, so sweet and kind, so gentle. But I know that they have suffered. They are orphans, after all, and have experienced tremendous hardship. Most of them have very bleak futures. My heart can't help but to break for them all. We all look forward to tomorrow as it brings another which to spend with these beautiful children, kids who truly are "the least of these." Please pray for them. Pray for their caregivers (who have a very difficult job under very difficult circumstances). Pray for the Buckner staff, who do such a great job. Pray for us on the trip. But most of all, pray for these kids. Pray, pray, pray in hopes that God will somehow make their lives better. Sorry if this was too long. I will try to be a bit more concise in the future. (Also, forgive any typos. I haven't taken the time to spellcheck.) Below are some photos of the kids. Enjoy! "Jambo" is a really fun word to say, give it a whirl. Anyway, I've been in Africa since Friday. Left Dallas on Wednesday, took 2 hours to fly to Chicago, took 7 hours or so to land in London, then enjoyed a quick 9 hour flight to Nairobi. Needless to say we were all ready to get off the stinking planes! Friday morning we woke up and headed to another plane, this one a small 12-seater Safari Link plane which took us to the Masaii Mara, the northern, Kenyan part of the Serengeti. We did a safari on Friday afternoon and Saturday morning. Saturday evening we flew back to Nairobi and spent the night again. Sunday morning we awoke and piled into some vans to head to the actual orphanage to attend church with the kids. Words on the internet are an inadequate medium by which to express the experience, but suffice to say that if I could afford it, I would fly over every weekend just to be there. Truly a moving, touching, emotional and deeply humbling experience to observe and hear poverty-stricken Kenyan people praising God in their sing-song English and beautiful-beyond-words Swahili. After eating lunch with the children, and spending some time just hanging out, we then headed back to Nairobi to pick up our luggage and headed to the retreat center, Brackenhurst, where we will spend the next few days. As I write this, it is Monday morning, and we are preparing for the kids to arrive at 10:00 am. We will then have a few days to put on a VBS for them, and spend time just recreating, hanging out, and getting to know these amazing kids. I will post again when I have time, and will try to upload some photos. Continue to pray for these kids, who have so very little.